Living in an area where this bodywork isn’t common I feel it’s necessary to work to educate massage therapists and the public on this healing path. I’ve been a massage therapist for 9 years and worked with Thai Yoga Massage for 7 or so of those years. Even after all this time the work is seen as an oddity to those who’ve never had anything else but a table massage. I remember years ago doing a demo where I lived in Baton Rouge and people walked by looking at me as if this was the oddest thing they’d ever seen. In retrospect, how does one demonstrate…massage? To put it in context we’ll have to go to where Thai Massage originates, Thailand, in southeast Asia. Thai massage in Thailand is the traditional healing method. It’s been practiced since time immemorial and it’s no different than going to a barber to get your haircut. Young, old, infirm and in between go and get work semiregularly and it’s integrated into the culture as a part of daily life. In Thailand it’s not really massage, it’s just what we do when we ache. Massage in our culture has roots in swedish and deep tissue massage primarily and is a western anatomical model of how bodywork is done. Thai massage has more roots in yoga and chinese medicine. Thai massage is done in public. It’s not done behind a closed door where you can go to sleep in the near dark. It’s not uncommon to be in a public space, mats on the floor and have 10 mats with 10 clients each receiving the work from 10 therapists. One of the more famous places to go receive a Thai massage is in a buddhist temple from blind monks. 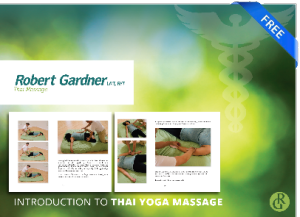 The history of Thai bodywork is influenced and hard to seperate from Buddhism and the practice of yoga. They’ve intertwined and influenced each other in myriad ways but as a practitioner one has to delve into these ideas and practices to understand how well they integrate. I started practicing yoga several months before I had my first Thai Yoga Massage and the work was so seamless it seemed like the exact same thing except one was active, the other passive. After a single Thai Yoga Massage I decided to study everything the teacher taught without exception. This work was some of the most healing I’d ever experienced. Gravitating towards feeling good and healing my body I knew this would become key to my growth and healing. So again, what is Thai Yoga Massage? Primarily it’s passive stretches, kneading and pressing on the body and musculature to help relieve tension and pain. Swedish and deep tissue massage is wonderful at treating muscles like a sponge, squeezing out blood flow and then allowing it to return so that muscles can heal rapidly. Thai Yoga Massage in contrast seems better at working with lengthening muscles and has more focus on ligaments, tendons and joints. After a Thai Yoga Massage one doesn’t typically want to go to sleep and there isn’t the lymphatic dump that happens after a swedish session. After a swedish or deep tissue massage many clients report wanting to take a nap or go to sleep. A Thai Yoga Massage client usually stands up and says, “I feel great. I feel taller.” Then they can return to work, but their mind is clear and that clarity seeps out into their thought and work. So, how does feeling unencumbered sound to you? Thai Yoga Massage is the best bodywork I’ve encountered and it changes peoples lives. I’ve been working for nine years. I’ve studied, learned, pressed, kneaded and done all in my power to help people and it’s all right here. Come experience the work, take a class for yourself. It’s time Thai Yoga Massage was common in Austin, Round Rock and in central Texas. This video is by a wonderful teacher named Kira. She also studied with Asokananda as did my teacher.